A drunk heroic medic went rogue, and as a result there's a site that pays $0.10 per 10 dead DayZ zombies. DayZ Bounty hasn't had Bohemia Interactive's blessing yet, but the mod has set up a website and is in alpha, with the express purpose of paying out cash for kills in Bohemia's zombie survival mod DayZ. It costs you $5 for 20 lives, but once you're in and racking up kills, you can walk away with a nice little cash bonus. It all started when a bunch of heroic medics got drunk and decided that saving lives was less fun than ending them. One of them promised $5 to whoever managed to bring him down, and when the dust had settled the group realized they were on to a good thing. "I thought: this is a fun way to play," said Jake Stewart, one of the founders. "This'd be great if we had a whole community of people that were doing the same type of thing." Hence the mod, which comes with its own server and in-game rules. The full ruleset can be found here, but in brief: each target has a bounty on its head, from the lowest on the food chain - those poor zombies, at $0.10 per 10 deadfellas - to the Outlaw. The Outlaw earns cash in-game for as long as he can survive, and the one who kills the Outlaw gets all the cash he had on him at the time his tasty giblets were harvested. The killer then becomes the Outlaw, to be hunted down in turn. The modders are limiting payout to $20 a time for the moment, which is hardly Vegas money; more a reward for a job well done. While it sounds fun, the mod does distance itself from the zombie survival fun that DayZ exists to provide. The founders of DayZ Bounty admit, in the game FAQ, that zombies "aren't what we want you, as the player, to focus on." Personally I'm lukewarm on a zombie survival game mod that effectively sidelines zombies, but if the idea of playing a shooter for modest amounts of cash appeals, the mod's website is here. 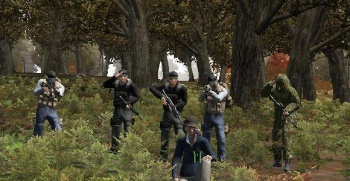 UPDATE: Bohemia Interactive has asked the creators of the Bounty mod to cease their activities. "We believe that the elements of gambling that DayZ Bounty introduces challenges the basic game design aspects that DayZ is built upon. It changes the focus of DayZ from being a creative, enjoyable, gritty gaming experience to a game that is based almost solely on financial gain and that is not something we want to be associated with."